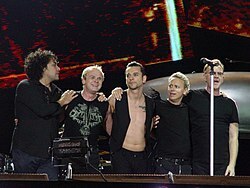 Adeetional muisickers Peter Gordeno (faur left) an Christian Eigner (centre-left), wi oreeginal members Dave Gahan (centre), Martin Gore (centre-richt) an Andy Fletcher (faur richt). Depeche Mode /dᵻˌpɛʃˈmoʊd/ are an Inglis electronic baund that formed in 1980 in Basildon, Essex. This page wis last eeditit on 18 Mey 2017, at 19:19.